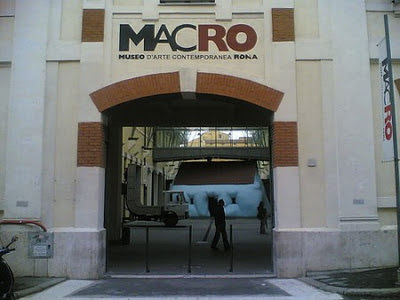 CCR is happy to invite members and their guests to a guided tour of MACRO, the contemporary art museum. The tour will be given in English and takes one hour. There is parking available with the access ramp in Via Cagliari 31. The museum is opened until 10:00 pm and the restaurant with terrace is opened until 11:00 pm. 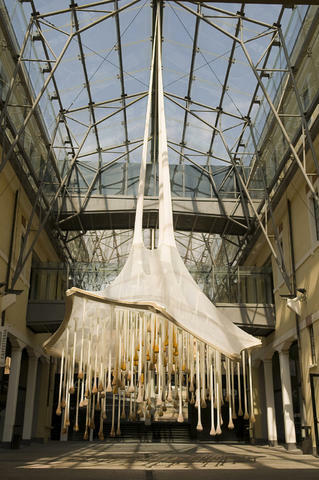 The first phase of conversion of the MACRO was completed in 1999 with the restoration of the old plant design of the Peroni brewery, built in the early twentieth century on via Reggio Emilia, and it has recently been expanded by the leading French architect Odile Decq. The new wing of the building, with the entrance at the corner of via Nizza and via Cagliari, creates a dynamic balance, integrating the new structure into the district, putting the museum in dialogue with the city, offering the visitors and Roman citizens both the new exhibition and urban spaces, such as the large terrace, the parking, the library and the restaurant. The New MACRO joins the spaces of the MACRO Testaccio and the Pelanda, inside the former slaughterhouse in Testaccio, to make this multifaceted cultural centre a Roman institution that aims to promote the value of contemporary Italian and international art. Ernesto Neto's "While nothing happens"
Inspired by the constant flux of Contemporary Art, architect Odile Decq has proposed a self-contradicting edifice that strikes a dynamic balance, at once a point of rupture generating conflict and creative instability while at the same time establishing a harmonious relationship with this ever-changing art, itself constantly tempting boundaries and resisting complacency. Decq’s building is situated on Via Reggio Emilia. Combined, the two buildings will occupy the full depth of the city block. By displacing the main museum entrance to the corner of Via Nizza and Via Cagliari, Decq has opened up an area that was previously hidden. Typified by the insertion of street-level windows into some of the exhibition halls, Decq removes traditional boundaries and ignores dichotomous perceptions of public versus private, urban versus cultural existences. The site’s new identity is perhaps most evident in the multi-level rooftop garden. Visible from the top floor of the MACRO’s first building on Via Reggio Emilia, the garden will appear as a panoramic abstraction. Accessible from various points within the museum, the roof will house a café and terrace seating, a garden and a point of intersection for visitors, artists, ideas, and admiration. The project’s façade, angled on via Nizza and via Cagliari, will be an enunciation of the old and the new. The structure opens passages to articulate the presence of the museum within the panorama of the street. Windows in the exhibition halls open onto the street revealing the interaction between contemporary art and the city.